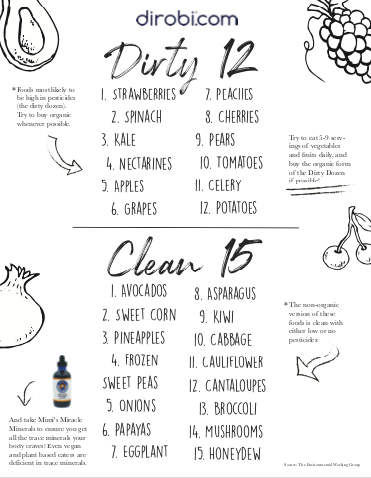 dirty dozen Archives - Dirobi Blog Only 1 in 10 US adults meet the federal fruit or vegetable recommendations (1.5-2 cups of fruit and 2-3 cups of vegetables) according to the CDC’s Morbidity and Mortality Weekly Report (MMWR). Of the vegetables eaten, the vast majority are potatoes, carrots and corn. ***Download a PDF you can print off and stick on your fridge! Just click on this image and download away, no opt-in required*** While getting a sufficient amount of vegetables and fruits is a great place to start in improving your health. Improving the quality if your vegetables is also important. This is not something to get "religious" about or determine that these foods must be organic or you'll die from eating them... the information is just to educate on which foods give the most bang for the buck when bought organically. Here's the list of those foods most likely to be high in pesticides (the dirty dozen) followed by those foods that have the least amount of pesticides: 1. Strawberries 🍓 2. Spinach 3. Kale 🥬 4. Nectarines 🍑 5. Apples 🍎 6. Grapes 🍇 7. Peaches 🍑 8. Cherries 🍒 9. Pears 🍐 10. Tomatoes 🍅 11. Celery 12. Potatoes 🥔 Other interesting take-aways from the report: - 70% of non-organic samples tested contained at least one pesticide, and many contained multiple pesticides. - One Kale sample had 18 different types of pesticides in it! - Many of these results are disturbing and many of these chemicals are banned for use on food in other countries. - The United States Department of Agriculture tests found 225 different pesticides and pesticide breakdown products on thousands of produce samples analyzed. Environmental Working group analyzed USDA pesticide residue data and found that almost 70 percent of non-organic produce samples tested positive for pesticide contamination. - More than 90 percent of samples of strawberries, apples, cherries, spinach, nectarines and kale tested positive for residues of two or more pesticides. - 60% of kale samples tested contained Dacthal, a potentially carcinogenic pesticide that's banned in Europe. It's use is legal in the US on Kale, Broccoli, Sweet Potatoes, Eggplant and Turnips. - The problem can't be washed away. Systemic pesticides are inside the produce and can't be washed away. Conversely, there are also the Clean 15! These are 15 products that you probably don't need to worry about buying organic: 1. Avocados 🥑 2. Sweet Corn 🌽 3. Pineapples 🍍 4. Frozen Sweet Peas 5. Onions 6. Papayas 7. Eggplant 🍆 8. Asparagus 9. Kiwi 🥝 10. Cabbage 11. Cauliflower 12. Cantaloupes 13. Broccoli 🥦 14. Mushrooms 🍄 15. Honeydew - Less than 1 percent of avocado and sweet corn samples tested positive for any detectable pesticides; they scored the cleanest of all produce tested. - More than 70 percent of fruit and vegetable samples on the Clean Fifteen list had no pesticide residues. - The EWG says multiple pesticide residues are extremely rare on Clean Fifteen vegetables. - Only six percent of Clean Fifteen fruit and vegetable samples harbored two or more pesticides. As a side note, some papayas and sweet corn in the United State are GMO, so in my opinion, it’s best to always choose organic for those. Practical take-away? I recommend, whenever possible, buying the organic form of the dirty dozen, or from a local farmers market or other known trusted source. The clean 15 I personally do not worry about organic. That's how I use it anyway, would love to hear your thoughts in the comments! The EWG (Environmental Working Group) is a well respected research organization that determines the pesticide levels in foods, among other things. Here are 12 foods that generally contain high amounts of pesticides and are best bought organic, and 15 that are generally ok, organic or not.